I have acquired an incomplete Flair Keil-Kraft Junior 60 kit. Most of the cut parts seemed to be present but there was no plan. I also acquired a full size Ben Buckle Junior 60 plan of the fuselage, but not the wing. The rear surfaces had already been constructed but not covered. I decided to build the fuselage to the Ben Buckle plan, modifying for electric power at the same time. The wing I intend to build by drawing up a simple layout on the building board and using the pre-cut ribs / tips etc from the kit. I will have to modify the wing centre section as it seems that there is a difference in the fuselage width between the two kits. It's easy enough to modify the fuselage to accommodate either setup at the moment, but which should I use ? When I built my Jnr60 I had to pack up the rear of the TE seat on the fuselage by just over 1/8 ". This stopped the plane climbing up so quick. Mine was built as per, but it flies with a lot of down elevator trimmed in - the equivalent of cymaz packing the wing TE! FWIW, mine flies just fine with the down trim. Secondly, you have a Flair J60, so download the plan from Outerzone, as mentioned above. Don't mess about with the (excellent) BB plan, they're not quite the same model. The BB plan is the original 1946 KK plan. The Flair plan is the 1955 KK second version of the J60. Just make sure that the person who built the plane didn't make unnecessary mods. i.e. make sure your plan really does correspond to the plan. Lastly, I've built quite a few Junior 60s (both types) and there certainly is no need to modify anything!!! Well Brokeenglishe's video takes me back to 1963 when I test flew my KK New Junior 60 for the first time. 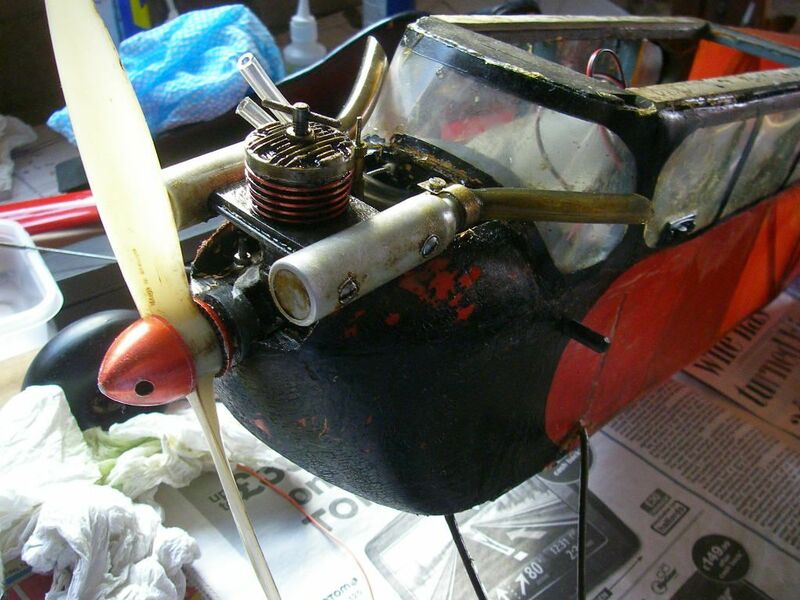 It was powered by an ED Racer and to test fly it in those days I just launched it into a free flight on Epsom Downs as I had never worked the Terrytone radio control before but was familiar with free flight. It always needed about 1/8 inch packing under the tail plane. As I have mentioned on this Website before the plane still exists as does the Racer. I did in the past add two silencer barrels to the exhaust stacks and an RC throttle/ carburetor. The junior 60 has had two lots of red nylon covering to date and I have recently re-covered the fuselage with Oratex but just need to finish off the refurbishment. Unfortunately the original plan was stolen with other aero modelling items but I do have full size copies of the Ben Buckle and Flair Junior 60 plans if required. Thanks for the prompt replies. I think I'll adjust the stabiliser seat to raise the l/e as suggested, that seems to be the easiest option. I take it that it's the relative difference in incidence that matters rather than where the difference is built in. IMO increasing the tailplane incidence is preferable to reducing the wing incidence. If you reduce the wing incidence the model will fly with the nose raised by the that angle and the built in downthrust will be reduced by the same amount. I have my Flair Jnr 60 rigged with the cg over 1" behind what's shown on the plan and the elevator permanently trimmed with some down. Been flying like that for 18 years with ic power & a further 3 years since conversion to electric power. Another point is that if you intend flying only in a sedate manner (as per 1940's & 50's) then I agree there's no need to modify anything. However if you intend to indulge in any aerobatics I think it's advisable to modify the wing retention method. I've witnessed a few Jnr's clap wings during loops which I think is caused by the position of the front wing retention dowels. The dowel's position means that there's about 4" of flexible fixing that has the potential of causing unwanted angle of attack changes during even mild aerobatics. The cabin structure isn't sturdy enough to allow the dowels to be fixed directly to the upper longeron but it's an easy mod to add a 4mm ply former between top and bottom fuselage longerons. I prefer use peg and bolt wing retention in my Jnr 60 but dowels would easier, if less tidy. Drawing with several mods including fixing for floats shown below. BTW IMO that the wing spar arrangement in the later version (KK 1955/Flair) is superior to the earlier version (KK original/Ben Buckle). 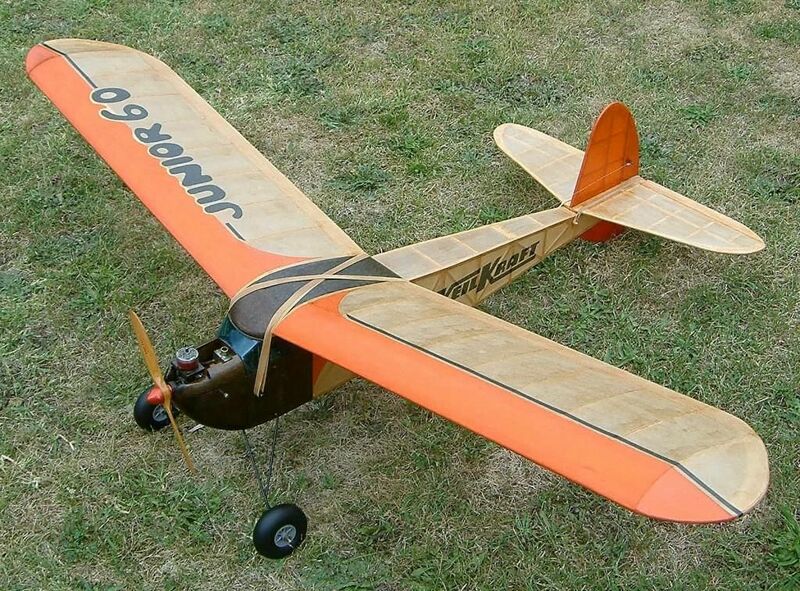 The Junior 60 was my first successful radio controlled model. The first one was built as per plan and it climbed all the time under power. I had to rebuild the fuselage after crashing the model. I was after all only a beginner then! For the second fuselage I simply ran the top longeron to the stern-post thereby raising the l/e of the tailplane. The model still climbed under power but perhaps not as much as with the original arrangement. I built a second Junior 60 for electric power about fifteen years ago and incorporated this modification. I sold both of them. The original i/c version was bought by my cousin who has never flown it. I offered to buy it back the other day. He's consulting his son! 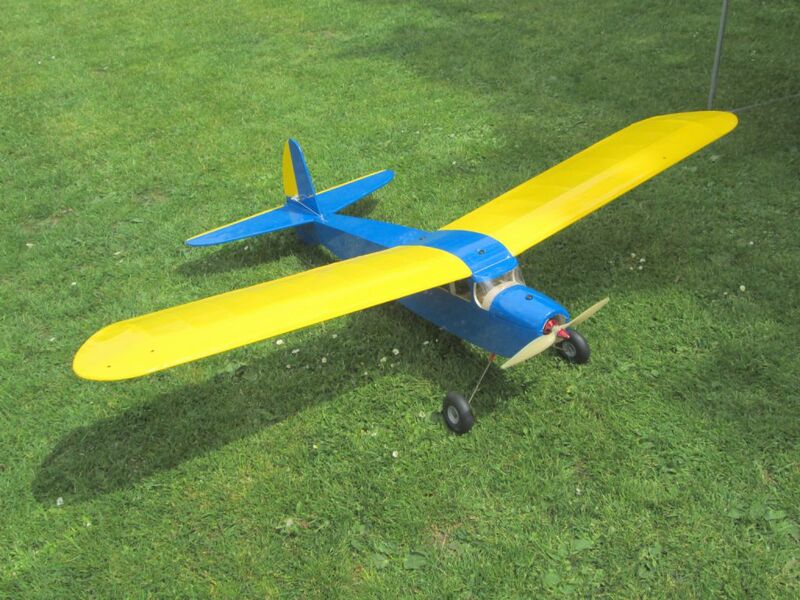 Just been observing a clubmates Junior 60 flying beautifully on rudder ,elevator and electric powered. He packed up the wing at rear by almost 1/4 inch. His model has reduced dihedral and therefore he increased the rudder size and reduced the fin so it looks the same. Has wing bolts instead of rubber bands. Purpose built for electric from an original plan. It's possible he lengthened the nose a little to achieve balance but it doesn't notice. kc, respectfully, that's just a random sport plane. The builder may have started out using a J60 plan, but it certainly doesn't look much like a Junior 60 now. They fly "beautifully" without changing anything at all. Brokenenglish Everyone builds their plane to suit themselves and flies in the way they prefer. Electrifying planes saves flying sites and should be encouraged. I suggest everyone ignores the vintage snobs and build whatever seems best for their flying requirements. 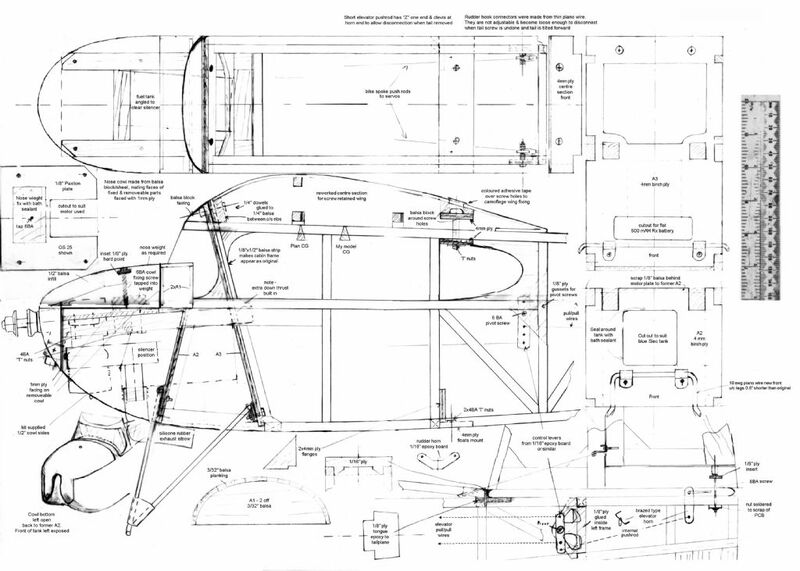 People here have provided information on how they have developed and improved the design to suit modern equipment now it's up to David G to decide which way to build his plane. Ok, the fuselage has been built to the Ben Buckle plan, the tail feathers were already built when I acquired the kit, so these will be to the Flair plan. The wing will be built using the Flair ribs but with the centre section modified to fit the BB fuselage and maybe with wing bolts. Battery access will be through the lower nose beneath the motor with an arming plug suitably placed for safety. I'll lift the stab. leading edge to match the Flair plan and see how it goes. Despite the mixed parentage I think it's going to recognisably be a Junior 60. Yeah. Sounds good. 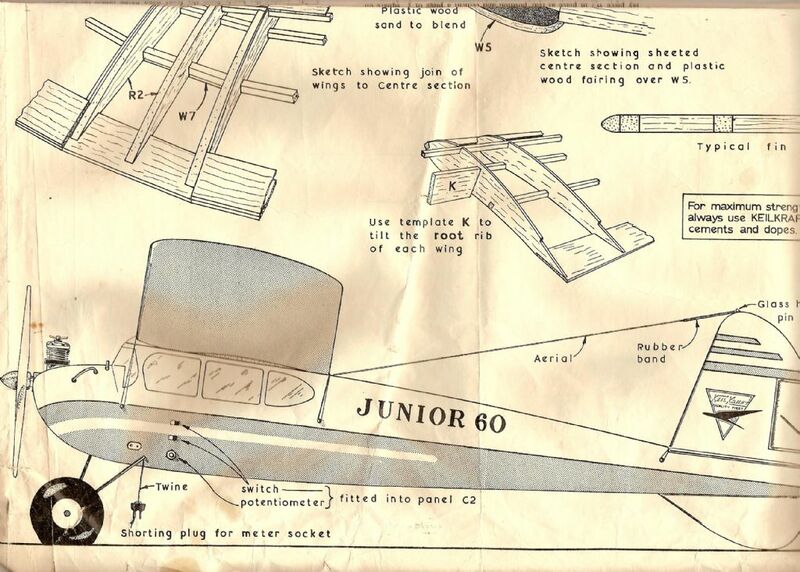 My next J60 (not this year) will be built to the 1955 (Flair) plan, but using the 1946 wood sizes. Albert Hatfull beefed up the rear end on the second version because of the weight of the "fifties" radio gear, without elevator control and, of course, we don't need that beefing up now. I know it's been said a million times before but, while finishing your plane, do everything you can to keep the rear end light. My first one (in the early eighties) weighed 3.5 lbs as built, but needed exactly 1 lb of lead in the nose. It flew great at 4.5 lbs, but was a bit fast and needed a lot of power (Rivers 3.5). I made an effort to keep the latest one (shown above) light. It weighs 2 lb 12 oz, with zero ballast. For kc, perhaps I wasn't sufficiently clear. Imagine someone building a Wot 4, but modifying it with dihedral, silk covering and banded on wings, so that it has a vintage look and flies around gently like a free flight plane, with zero aerobatic capability... Wouldn't you consider that the person had picked the wrong plane? I'm interested in your conversion of the E.D.Racer as I i'm thinking of doing the same to mine . Could yo give some more details , are the exaust manifolds self made or commercial items , and how did you connect up the R/C carb . My view is that anything anyone can do to improve any plane so that it flys better is OK ( within safety limits) if it suits the owner. So if you can improve a Wot 4 then do so ( nobody's managed much improvement though! ) Model aircraft have gradually evolved over the decades but if the attitude that ' nobody must change a Junior 60 at all' had prevailed since the 1950's then we wouldn't have progressed to todays amazing planes. It's the experimenters who change planes- perhaps bit by bit- who have achieved this progress. And by being open and explaining the changes the experimenters have helped us all. Let's not clog up this thread with further discussion on this aspect but I will just quote the words of my colleague who built the modified J60 . Yesterday when I was asking what changes he had made he told me about the changes and then said " I don't know how we used to fly these on single channel ! " but of course he did know because he had done it and what he really he meant was the flying is now more enjoyable. That's what it's about. Enjoying the flying. My Junior 60 experience is limited to the later 1955 version which had a stronger wing. The original 1946 model was designed as a free flight model which would climb under power and glide back to the ground when the engine cut. I simply continued the upper longeron to the sternpost as stated above, in order to raise the leading edge of the tailplane to reduce the model's continuous climbing under power. I can't say whether this modification made much difference as my first Junior 60 had crashed by then so I never had that model alongside my modified one to compare it with. It made the construction of the fuselage a bit easier. The later Super 60 was a better trainer, it went where you put it and could fly quite well in a wind, however, I love the floaty way in which the Junior 60 flies and hope to buy back the one I sold to my cousin!